Universal Design for Learning is ultimately about disturbing tradition in education. In fact, it may be among the most disturbing things to happen in education in the 21st century. 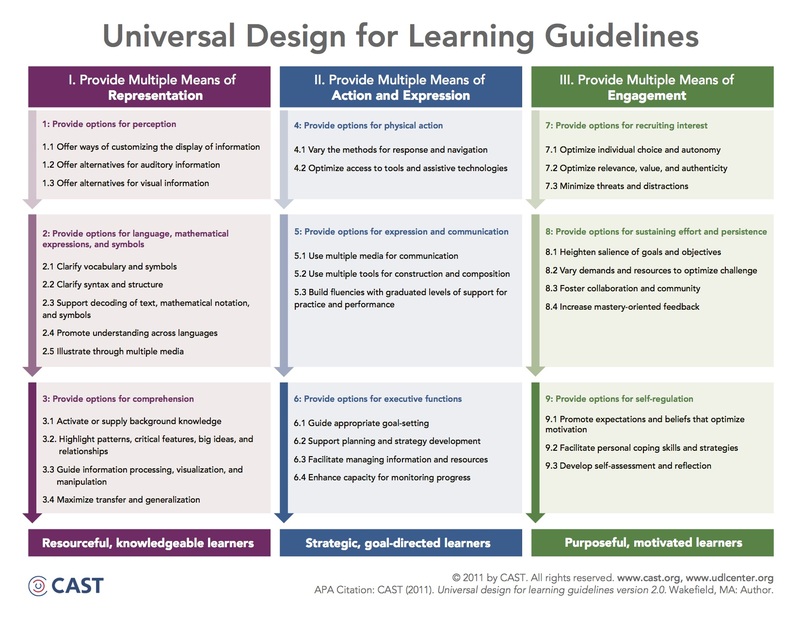 Universal Design for Learning (UDL) is a framework for designing multiple and flexible strategies for learning experiences that are effective for our variable and diverse students. UDL puts emphasis on the role of the environment on enabling or disabling learners, rather than negatively labeling students themselves. How do instructors go about developing environments in which variable students may thrive without sacrificing rigor and challenge? That's what UDL seeks to accomplish. Two ways to understand UDL are linear and radial. A linear understanding of UDL focuses on the whole instructional design process. According to UDL, good instruction doesn't start with determining material or instructional methods, but with good, clear learning objectives and progresses through faithful delivery and reflection. Multiple means of representation, to enable options for how learners acquire and comprehend information. Multiple means of action and expression, to enable options for how learners interact, communicate, and express their knowledge. Multiple means of engagement, to tap into learners' variable interests, provide appropriate levels of challenge, and increase motivation. These principles form the top line of the UDL guidelines. In so doing, instructors recognize that not all students learn in the same way, that traditional instruction tends to be narrow in terms of flexibility in methods and materials, and that increasing options and flexibility in how students acquire information, express themselves, and engage in the learning means more students are able to experience optimal learning conditions, for the benefit of all. These two ways of viewing UDL are both accurate. One focuses on the longitudinal design process, the other focuses in on how to expand who is included when designing assessments, materials and methods. As a dynamic framework involving both instructor and learner decision making, UDL is not a two-dimensional method (intervention - result), but a three-dimensional framework (e.g., instructor facilitation - student choices - result). Both the application of accessibility guidelines and the UDL design framework are intended to ensure equitable access for a variable range of students (e.g., ability/disability, interests/motivation, background knowledge/skill). Both call for proactive (design-oriented) strategies as opposed to reactive (e.g., accommodation-oriented) approaches. And ultimately, applying both will have the furthest-reaching benefit for your students, as depicted below. The best reason to invest time in UDL in higher education is because it works. Designing with UDL means improved effectiveness of instruction and -ultimately- efficiency for the learners and instructor alike. We know that at the University of Tennessee, some student groups are currently less likely to engage in a given class, learn in traditional ways, and ultimately graduate. 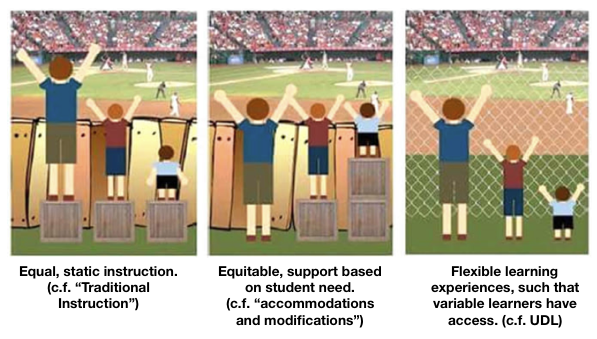 UDL provides us with a framework to remove barriers for all of our students without sacrificing rigor. Is UDL supported by theory and research? Yes! A great deal of it! In terms of the linear design process, UDL draws from strong foundational theory including the works of Piaget, Vygotsky, and Bloom, who drew from similar principles for framing individual differences and the teaching strategies for addressing them. Additionally, this design process overlays with established best practices for design from the fields of instructional design and universal design (originally an architectural concept). 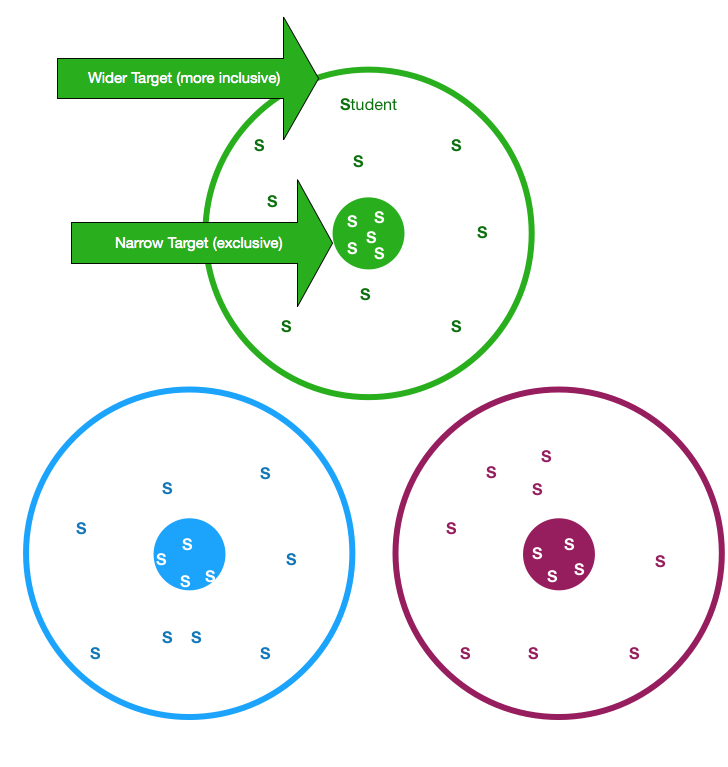 In terms of the radial approach to UDL application, the UDL principles and guidelines are supported by over 800 peer reviewed research articles, provide benchmarks that guide educators in the development and implementation of UDL curriculum. UDL doesn't create new methods of teaching and learning, but rather organizes and frames established best practices according to recent developments in neuroscience and cognitive sciences regarding how humans learn. Getting started with UDL can seem daunting. But UDL practitioners will be the first to point out that UDL implementation is about starting small and scaling up. What matters most is a willingness to jump in and get going. So what are some small ways to start? Listen to a podcast from Teaching in Higher Ed where Bonni Stachowiak, Ed.D speaks with Mark Hofer, Ph.D. about his experience in implementing UDL in his teaching (para. 3). Want More Support / Professional Development? I am a specialist in UDL implementation particularly in higher education and in Canvas and available for consults (view my website). Other consults can be discovered via the UDL Nexus. What a great resource; thanks for creating it, and Eric Moore Welcome to the Canvas Community! I've shared this blog post with the Higher Education, K-12, and Accessibility groups to broaden its exposure. You won't have to join those groups to see responses from their members, but if you'd like to join, you can easily do so by clicking on the link to the group and selecting Join Group from the Actions dropdown at the upper right of the group home page. Thank you! I will join those groups!